Since the iPad 2 entered our lives, it has seen tablets like the Motorola Xoom, the LG Optimus Pad and recently the BlackBerry Playbook bid to take its best tablet crown. The HP Touchpad is the latest tablet on the scene sporting a iPad-like 9.7-inch screen and packing WebOS in the hope of giving the iPad 2 a run for its money. Is up to the task though? Is it good enough to challenge a prime candidate for T3's 2011 Tablet of the Year? We've pulled the two tablets together for a head-to-head. Lifting the iPad 2 out of the box, you almost feel like you're handling Grandma's best china, such is the skinniness of the 8.8mm frame. Remarkably though, the tablet retains a very sturdy feel. It's not the least bit fragile and there's zero flexibility. It's a piece of engineering that defies physics. The weight has also dropped. At 601g (for the WiFi version) the tablet has shed 15 per cent of its body mass. Big deal, you say, but you will notice the difference. It's still not Kindle-light though, and we still found the one-handed grip uncomfortable. The design itself has evolved with the edges now rounded like an iPod Touch. While it looks better and is less bulky, the thinner edges actually make it more difficult to keep a steady hand. You also have to adopt an awkward reach-around approach to access the volume and screen switches. Like most of HP's consumer touchy feely devices, it is glossy piano black and a haven for smudges. That said, we had no qualms with the added weight and dimensions because it's so much more robust than an iPad. Aside from the blister home button on the right, the only other buttons are a volume rocker, off button on the left and there's a mini USB to plug in to the PC. There are two speaker grilles on the left and right for HP Beats Audio tech, which is a little underwhelming until you plug headphones in. While we were blown away by the original iPad's 9.7-inch 1024x768 LED-backlit display, we were hoping this would bring a version of its iPhone 4 Retina Screen. Now it hasn't, we're a little disappointed. While indoor performance is still great and colours are truly vivid for gaming, photos and videos, in the post-Retina Screen world, text still isn't quite as crisp as we'd like and it's still pretty useless in sunlight. It also attracts a lot of finger marks. Lets hope an improved screen comes on any iPad 3 next year. On paper, HP has stuck to the iPad 2's blueprint rigidly, using the same quality 9.7-inch multitouch display with a 1024x768 resolution. HP hasn't told us if the screen uses the same IPS tech inside but the colour palette is rich, details are razor-edge sharp and the viewing angle is wide. Add the toughened Gorilla glass and the TouchPad feels like it was made to survive. Beyond the design refresh, the iPad 2 comes packing the new iOS 4.3 operating system. You get the usual folders, multitasking, Airplay and customisable screens. iTunes Home Sharing, another addition, offers a seamless liberation of your entire music library over Wi-Fi, with one-touch. The new OS also allows you to customise the side switch to either mute the device or lock the screen. It's a handy bonus, but by no means earth shattering. 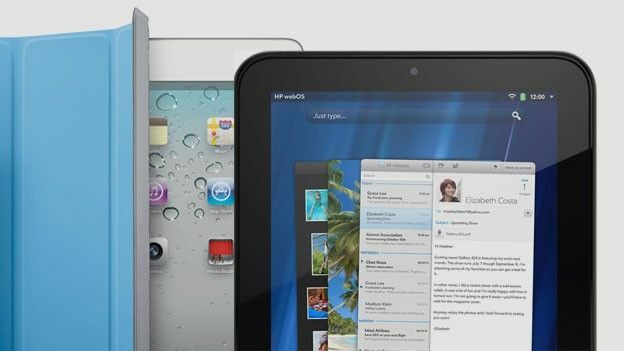 An iOS 5 launch is set for this autumn, so iPad 2 features are set to get a whole lot better as well. It is very slick and geared for multi-tasking without getting us lost in Escher-like mazes of apps and difficult to find tasks. We tested this with HD video played back over Wi-Fi and several web pages open, plus a couple of apps running. Try as we might, we couldn't hit lag and didn't encounter any staccato playback because it's just too responsive. Where HP really excels, is in the social networking and contact management synergy – they are seamless. The HP TouchPad syncs contacts and social networks, fusing them together with beautifully laid out icons that make it a real joy to use. Of course the other change comes with the addition of cameras. FaceTime video calling is now available for iPad and while the quality won't blow you away it does the job. The rear-facing camera is passable, offering decent snaps in good conditions, but drab colours and limited detail the rest of the time. It's nowhere near as good as the iPhone 4's excellent 5-megapixel offering. The Touchpad features a 1.3 megapixel front facing camera but there's no sign of a rear-facing camera which by no means is a disaster if you consider the quality of snaps the rear-facing camera on the iPad 2 can deliver. Notably there's also no video recording, video out to get HD playback on your TV either. The Apple App Store recently notched up 100,000 iPad apps and continues to grow by the day. If you take into consideration that the iPad section of the store launched just over a year ago, that is pretty impressive. You can of course find all the latest and best iPad apps at the T3 App Chart. HP will have to build up its app to if it wants to deliver an ecosystem to keep us coming back. At the moment, the App Catalog cupboard is bare though there are apps for Kindle, the Guardian, Sky, Facebook and…yes…Angry Birds in HD. The good news is that the TouchPad should be good enough to keep developers interested and the monthly tech mag app Pivot might keep punters coming back. It's still early days for the HP Touchpad and while we love it's multitasking prowess, glossy design and social networking capabilities, it's lacking in one crucial department where the iPad 2 currently excels, and that is apps. This can and is likely to change once developers get their hands on the WebOS platform, but for the time being the iPad 2 is way ahead on the apps front. If you are basing your tablet buying on what applications you can pack onto it, we'd go for the iPad 2. That combined with the extra processing power, graphical improvements, brilliant UI and that sleek design makes the iPad 2 the winner in this battle of the tablets. Do you agree that with the iPad 2 vs HP Touchpad verdict? Lets us know your thoughts via Facebook and Twitter.